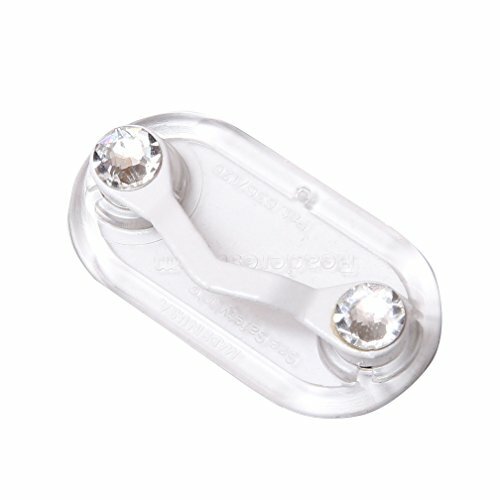 The white ReadeREST with genuine Swarovski crystals is a beautiful portable eyeglass holder that is elegant and highly functional. You will no longer be searching for your glasses or buying 10 pairs of reading glasses to put everywhere because you keep misplacing and losing them. NO MORE, losing, misplacing, breaking, and dropping your glasses. LONG LASTING, this ReadeREST is made with strong neodymium magnets and a stainless steel front clip. ELEGANT DESIGN, this item is made with genuine Swarovski crystals. LIGHT-WEIGHT, weighing only 0.2 oz, which means it will not pull down even on the lightest of clothing fabrics. If you have any questions about this product by ReadeREST, contact us by completing and submitting the form below. If you are looking for a specif part number, please include it with your message.